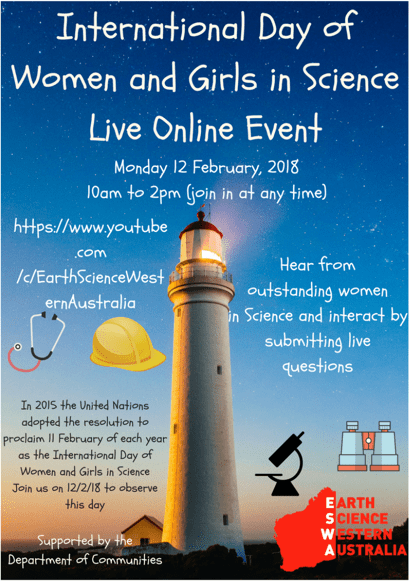 ESWA, Earth Sciences Western Australia, is holding a live, on-line event Monday 12 February to celebrate the International Day of Women and Girls in Science. The event will be streamed live on ESWA’s YouTube channel between 10:00 am and 2:00 pm Perth time (GMT+8:00) and will be recorded for viewing later if you can’t join the live stream. Hear from outstanding women in Science and interact by submitting live questions. Suitable for girls and boys, women and men of all ages. Pitched at girls and boys in upper primary and lower secondary school. 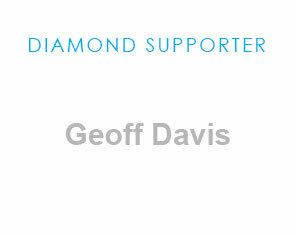 Click here for the event schedule and speaker details. This is a great opportunity for anyone to hear from a great selection of speakers on science career options for young people, not just in Western Australia. Applications for 2018 deadline extended – 15th November 2017! 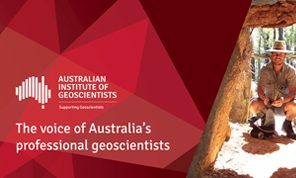 For the 2017 round of applications, additional funds will be made to early-career geoscientists that propose to make a significant contribution to the Australian Geoscience Council Convention to be held in Adelaide in October 2018. Significant contributions that will be considered include, but are not limited to: contributing to the organisation of the convention by joining a Sub-committee, convening a session or workshop, leading a fieldtrip. It’s free, and everyone is invited to participate — school kids, university geology students, professional geoscientists, gem collectors, members of the public…and everyone in between! Significant book prizes to be won! Last year’s #OzRockStocktake was such a success that we are doing it again! Please join in the fun during international Earth Science Week (8-14 October 2017) and get involved in the Australian Geoscience Council’s second ever #OzRockStocktake! #OzRockStocktake is the annual social media ‘stocktake’ of Australian geology. 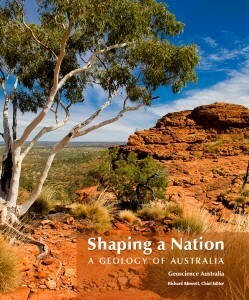 The best photos posted during Earth Science Week on Twitter, Facebook, LinkedIn or Instagram — using the #OzRockStocktake hashtag — will win a stunning print copy of Shaping a Nation: A Geology of Australia, edited by Richard Blewett and kindly donated by Geoscience Australia ($75 value each). Four copies will be given away — one to each photo from the four social media sites. 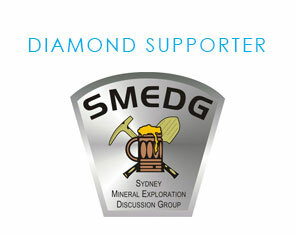 This is a great opportunity to be involved in an innovative social media project that is tracking and recording Australia?s vast geological heritage. 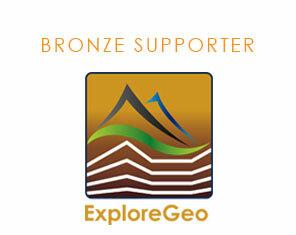 Post anything from your favourite precious stone to your favourite geological outcrop or mountain landscape! We look forward to your involvement… and remember, please upload your photos on social media from 8-14 October! The Call for #RFG2018 Abstracts is officially open! Resources for Future Generations 2018 (RFG2018) will showcase advances in earth science, societal and technical innovation, and education that can change the course of history. Present your work to an international cohort of scientists, policy-makers, innovators, educators, industry leaders, and visionaries who are committed to creating a sustainable future. Be part of the sustainable future. Submit an abstract. Abstracts will be accepted until January 15, 2018. AIG is a partner organization for this conference. Applications for this year’s program close on Friday 4th August. Application guidelines are available here. The Australian Institute of Geoscientists’ Student Bursary Program was initiated to promote and support geoscience research and education in Australia. The Bursary Program began in 2001 to mark the 20th Anniversary of the Australian Institute of Geoscientists (AIG) and, since then, the AIG has awarded 173 bursaries to geoscience students in Australian universities. In 2017 the AIG is again offering bursaries to Honours, Postgraduate and Third Year geoscience students. Applicants must be current and financial Fellows, Members, Graduate Members or Student Members of the AIG at the closing date for applications. 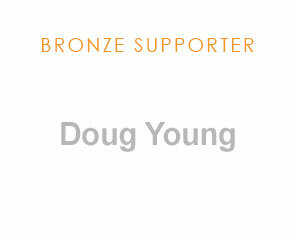 The bursaries are funded via the AIG Education Foundation. 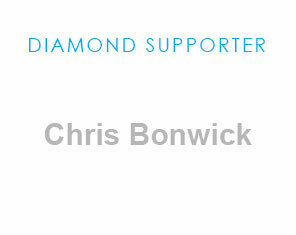 This is a charitable foundation and, under Australian taxation legislation, awards can only be made to Australian citizens or permanent residents.